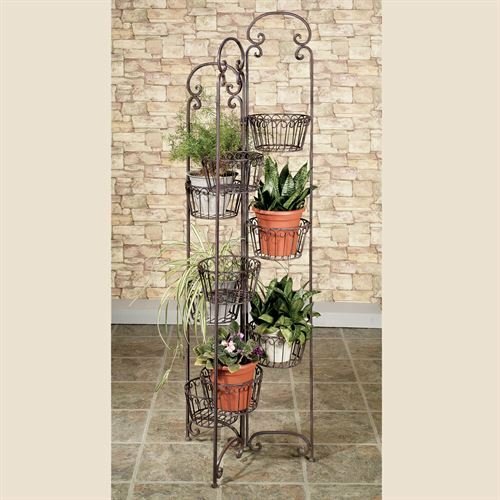 The wrought iron zaria plant stand offers nine baskets for creating a beautiful floral display. Handcrafted plant stand is perfectly suited for your sunroom or patio. Furnishing is handpainted with a tuscan slate finish. Measures 19 wx17 dx65 h; weighs 27 lbs. Handpainted & handcrafted plant stand multiple baskets for plenty of display space each basket will hold your flower pot up to 8 may be used indoors or outdoors. The wrought iron zaria plant stand offers nine baskets for creating a unique floral display. Handcrafted plant stand is perfectly suited for your sunroom or. . . If you have any questions about this product by Olivia Wong's, contact us by completing and submitting the form below. If you are looking for a specif part number, please include it with your message.